I really wish I could have recorded the moment when my friend arrived to pick up her cake order, because it was one of the most precious memories I'll have for a long time! 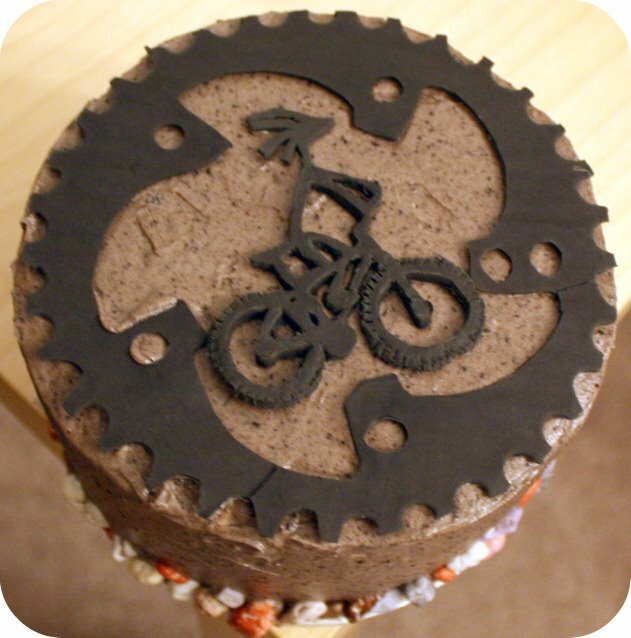 You see, Stephanie had ordered two cakes to celebrate two birthdays: one for her husband Roger that was decorated with a mountain biking theme, and a second one for their friend Gavin who is a die hard Liverpool Soccer Club fan. Stephanie was trying to keep it a surprise but eventually had to spill the beans. Stephanie, her husband, and their new baby Conner arrived at my house late on an overcast Friday morning to pick up the cake as they were leaving to go to Cannon Beach for the weekend. At first Roger didn't know why they had to stop by my house but the moment he got out of their truck, he had this big grin on his face and said, "Ohh! Am I getting a Julia cake?!" and then proceeded to jump up and down like a little kid. So adorable!! I had the cake covered in a box but he couldn't wait to see it. With Stephanie's permission I opened the lid to show it to them and the look on his face was absolutely priceless. He loved it! I gave them a moment alone while I went in search of a better carrier; and when I returned, Roger and Stephanie were hugging. He was thanking her for his birthday cake, it was a very sweet and genuine moment. It was something very special; I was so excited to be a part of it, and it will be something I won't soon forget. For the design of Roger's cake I used a combination of designs that I found on the Earth Design Website (which is a really cool site, check it out! ): a sprocket wind chime and a Kokopelli guy doing a wheelie. I decorated the base of the cake using chocolate rocks that I found at my local grocery store's bulk food department. 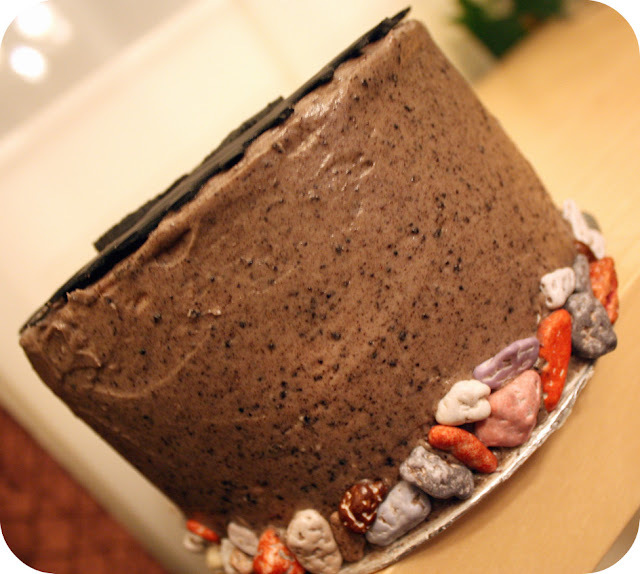 For the cake itself, it was a very deep chocolate that was filled and frosted with Oreo frosting. I had made way too much filling and decided to use it to frost the cake, which in the end was a good thing because it replicated the look of mud! Just one of those happy accidents. This chocolate cake recipe is one that I use a lot but this time decided to try something different and replace the sour cream with Oikos Greek Yogurt. The good folks at Stonyfield farms sent me some coupons to try their yogurt for free, and it was excellent! According to Stephanie and Roger, the cake was really moist and a little tangy (in a rich, dark chocolate sort of way). Yield: Four 6" chocolate cakes or three 9" cakes, 24 cupcakes, or one half-sheet cake. Preheat the oven to 350F. Brush the bottoms and sides of the pans with melted butter and line the bottoms with parchment paper. 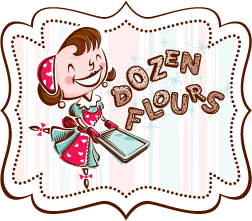 In a large bowl, sift together the flour, coco powder, baking powder, baking soda, and salt. Set aside. In a separate bowl, combine the yogurt, vanilla, and almond extract. Set aside. In the bowl of a standing mixer fitter with a paddle attachment, combine the butter and sugar and beat on medium speed until smooth. Set the mixer to low speed and add the eggs, one at a time, scraping thoroughly between each addition. Alternately add the flour and sour cream mixtures to the butter mixture in two batches, starting and ending with the flour mixture. Scrape down the bowl after each addition. Divide the batter evenly between the cake pans. For 9-inch cake pans, bake 1 hour or until a toothpick comes out clean; for half-sheet pans, bake 45 minutes or until a toothpick comes out clean; for cupcakes, bake 20 to 25 minutes, or until they spring back after being touched. Allow the cakes to cool for 20 minutes. Once the cake is cool, release it from its pan by running a metal spatula or knife along the sides of the pan. Flip the cake over onto another pan or cake board and peel away the layer of parchment. Using the whisk attachment on your electric mixer, mix the powdered sugar, salt, vanilla and milk at low speed until smooth. Add shortening and whip at highest speed 10-12 minutes, until volume increases by at least 50%. Add crushed Oreos, beat on high speed until it's well combined. Very cool! Those designs look really intricate. Wow! That oreo frosting looks delicious!!! These look great! I love the idea of using the Greek yogurt in the chocolate cake instead of sour cream! Wow. You did an amazing job! I especially love that biking one. The giant gear with the cutout inside is just genius. Did you do the fondant cutouts free hand? They're awesome! I can draw not great but decent and they would have been tough to do with pencil. i love the idea of making oreo frosting. I can't wait to try this out. Those cakes are so neat and I love his reaction to your "julia cake" cute. I just found your blog from a link on Bakerella, and I couldn't be happier! Your cakes and cookies are gorgeous, and I love that you share your recipes for such lovely creations. Thanks for being a great baker inspiration!!! Your fondant designs are to die for. And what fun the cakes are. Oreo frosting? I'm drooling. Love your Blog!!! Great job on the cakes!! I just found your blog and am I ever happy, I did. Your cakes are outrageous and that is meant in the best way. Thanks for sharing them. You have such a talent for cake decorating, they are both fantastic cakes! This recipe is missing the sugar measure. Could you please add this? I´d love to make the cake. I'm SO sorry that I forgot that! Yikes! I've updated the recipe. Thanks for pointing that out.